While I have spent the last several weeks in Miami trying out new restaurants and recipes, the slow cooker that I hauled all the way from NJ has been sitting idly and nearly forgotten in my kitchen. In packing it into my car for the long trip south, it seemed like it would be the perfect kitchen utility. I envisioned myself throwing in a bunch of random veggies and proteins, leaving for work, and coming home to a hot and perfectly cooked meal. What I didn’t realize was that I would be working long days and that the crockpot didn’t have an automatic timer to turn it from the cook to warm setting…Thus, this Sunday I took a little bit of time to plan out specific recipes to use (adjusting for the tiny 2 serving size of my slow cooker), make a shopping run, and cook my first two meals with supervision. Since I had time, I cooked 2 different recipes so I could stock up on food for the week. 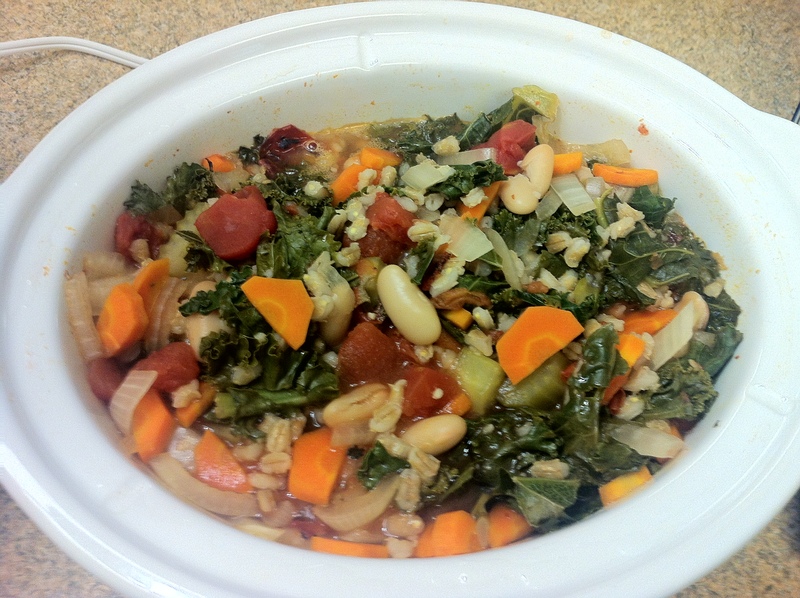 The first recipe was adapted from “Skinny Slow Cooker” and was a vegetarian Mediterranean Stew. I first added chopped carrots, celery, onion, fire roasted tomatoes, chicken stock, crushed red pepper, and barley to the pot to cook for about 2 hours. The original recipe called for farro, but since Publix had a limited grain selection, barley was the closest substitute. After 2 hours, I then added lemon juice, cannellini beans (white kidney beans), and a large helping of kale to cook for about another hour. When the stew was finally finished cooking, I dolled it out into a bowl and topped with some feta cheese. My favorite thing about this dish was that there were so many veggies and that the cooking hadn’t softened them too much. The celery and carrots still had some firmness, while the onions were soft, the kale was chewy, and the beans were meaty. The barley brought everything together, creating a filling meal and making just a few ingredients go a long way. I also found that after refrigeration the barley tended to soak up the liquid, making the dish much less like a stew and more like a salad or salad topper. For lunch this week, I spooned some of the cold mixture over a bed of kale, adding a small drizzle of balsamic vinaigrette to flavor the leaves. Surprisingly, the cold stew with the sharp acidity from the vinaigrette was just as satisfying as the hot, soupier stew. 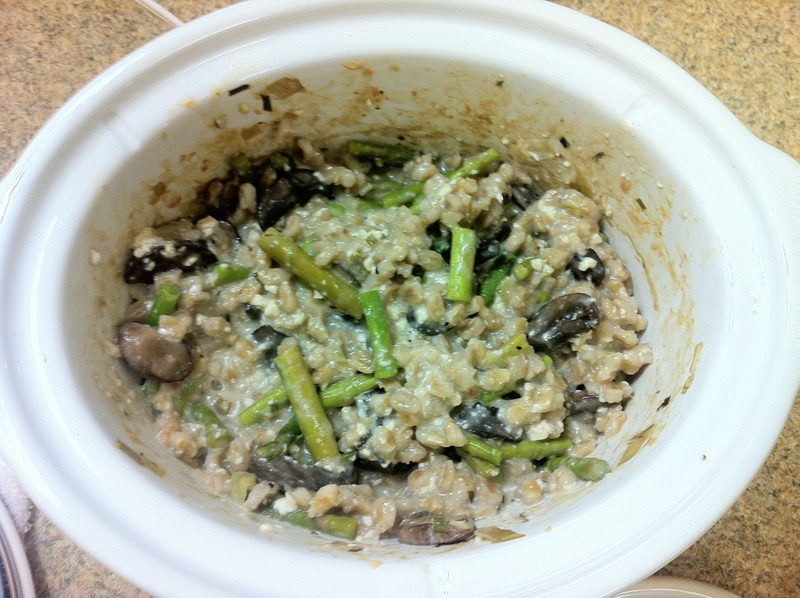 The Mushroom Asparagus Risotto recipe was one that immediately caught my eye while flipping through “Skinny Slow Cooker”. When our family took a European vacation when I was about 7 we stumbled upon perhaps some of the best risottos I’ve eaten to this day. We didn’t find it in Italy or in a five star restaurant, but at the Marriott restaurant on the eve of our departure back to the US. Luckily this recipe was somewhat nontraditional in an attempt to be more healthful. Instead of using the typical Arborio rice, this risotto also used barley, which I had on hand. I first cooked the barley, chicken stock, leeks, sliced baby bella mushrooms, and black pepper together for about 2 hours and 45 minutes. I then added sliced asparagus and a mixture of silken tofu and 1/3 fat cream cheese (mine was flavored with chives and onions). This tofu, cheese mixture helped to thicken up the risotto and added a creamy texture to it all. In future I would blend the two ingredients in my magic bullet to avoid clumps. However, laziness and the fear of overexerting my bullet on the thick mixture deterred me from doing so. Although the clumps didn’t affect the taste or bother me, the presentation could definitely be improved by a thorough blending. The risotto then cooked for another half hour on high before ready to serve. Perhaps the best part about this day of slow cooking was the amazing aroma that filled my room. Since I was doing my laundry simultaneously, I loved leaving and then walking back into my room several times to be greeted by the earthy and rich flavors created by the slow cooker.